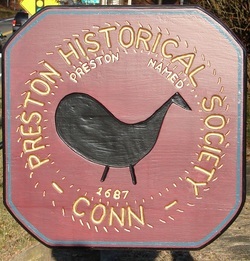 The Town of Preston's geography and soil have influenced its historic development. Agricultural use of the land has been conditioned by soils and topography best suited for livestock grazing and corn production. Numerous streams provided waterpower for industrial development. While woods cover much of the town, they represent second growth forests which have gradually covered abandoned fields. The dominant species are oak and hickory. White-tailed deer and small game are numerous. Freshwater fish such as trout are found in the streams of Preston , while the waters of the Thames and the lower Shetucket host a variety of species of fish, such as striped bass, shad, alewives, eels and menhaden. Poquetanuck Cove is rich in shellfish. In earlier times, the Thames River provided access to distant markets. railroads and highways have since displaced waterborne transportation. Preston still retains much of its earlier rural character despite slow residential development. Area attractions include Strawberry Park, which is an award-winning 160-acre campground nestled in the heard of beautiful southeastern Connecticut; with electrical connections as well as log cabin and RV rentals; Long Society Meetinghouse (a historic meetinghouse in the village of Long Society); Preston Historical Society; Dalice Elizabeth Winery; Preston Ridge Vineyard; and Hallville Mill Historic District.